Compared to traditional VATS, the uniportal has some advantages. It provides a vertical, caudo-cranial perspective which preserves the depth of intraoperative visualization. Besides, the uniportal approach helps the surgeons keep a standard body posture straight facing monitor with minimal neck movement. 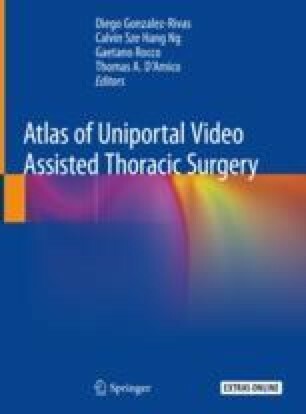 However, the right middle lobectomy has a problem with uniportal VATS: the surgical approach through intercostal incision is merely vertical to the vessel plane, which leads to a great vary of operation difficulty. Thus, we summerize our experiences of the right middle lobectomy with the uniportal VATS. The online version of this chapter ( https://doi.org/10.1007/978-981-13-2604-2_19) contains supplementary material, which is available to authorized users.